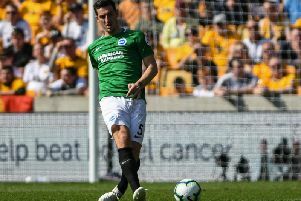 Brighton & Hove Albion goalkeeper Mathew Ryan felt Burnley scored their goals too easily at the Amex in their 3-1 Premier League win on Saturday. The defeat increased Brighton's winless league run to six games and they are now just three points clear of the relegation zone. Burnley's opener came when Lewis Dunk's slip allowed Chris Wood to break through and fire home. Wood side-footed home the second after Dwight McNeil burst through the Albion midfield and the third came from the penalty spot through Ashley Barnes after Ryan brought Barnes down. Ryan said afterwards: "Defensively we were too soft. I think every goal that they scored or they seemed to create their chances with far too much ease. "When you defend that way you don't give yourselves a chance. "The next test now is to show a bit of character and bounce back from this. It happens to the best teams in the world, every team out there. "No doubt we will get back to our strengths and clean up the defensive side of things, be more stern at the back. "The next one in the league is Leicester away and it's going to be important showing a reaction there." Ryan was frustrated with referee Stuart Attwell's decision to give Burnley a penalty for their third goal, just moments after Brighton had spot-kick appeals of their own waved away when Burnley midfielder Jeff Hendrick handled in the area. Brighton's keeper said: "I'm all the way up the other end. I can't see but everyone is pretty adamant that it's a penalty. "I can't just disappear into thin air, so I'm not sure what more I can do. "He (Attwell) gives it, it's probably a little bit him (Barnes) feeling bad.